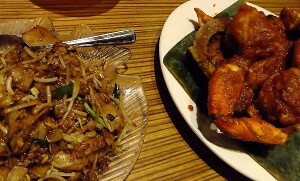 Seeing as we had an expert Singapore food-taster at our table, I asked Richard to compare the Banana Leaf’s version of Char Kuey Teow to the one served in Singapore. He gave it 95 out of 100, noting that in Singapore the dish was a tad smokier. I also remembered it as being smokier the previous time we ate in the restaurant, and then noticed that for $2 extra you could add Chinese pork sausage. 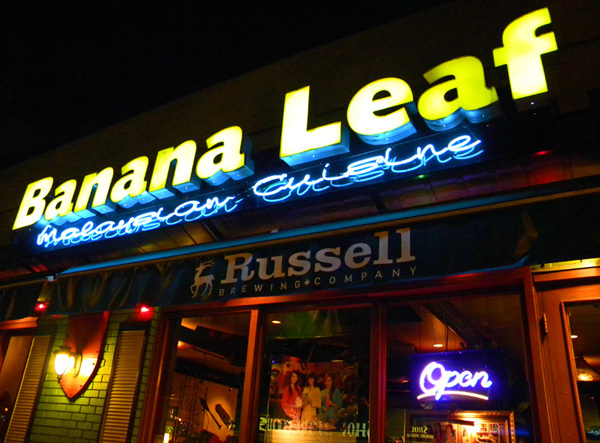 The next time we were at the Banana Leaf, we ordered it WITH the sausage. Success – I suspect if Richard had the version with the Chinese sausage in it he would have rated it 100/100! Dungeness Crab in Singapore Chili Sauce: this is Singapore’s national dish, whole crab, shell-on, cooked with chili sauce blended with lemon grass, tomato & egg. 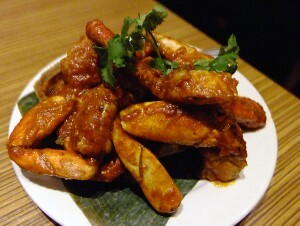 Richard, our professional Singapore foodie, gave this dish a 95/100 compared to the crab in Singapore, saying that in Singapore the sauce seems to permeate the crab more. Wow, he moved Singapore way up on our list of places to go! 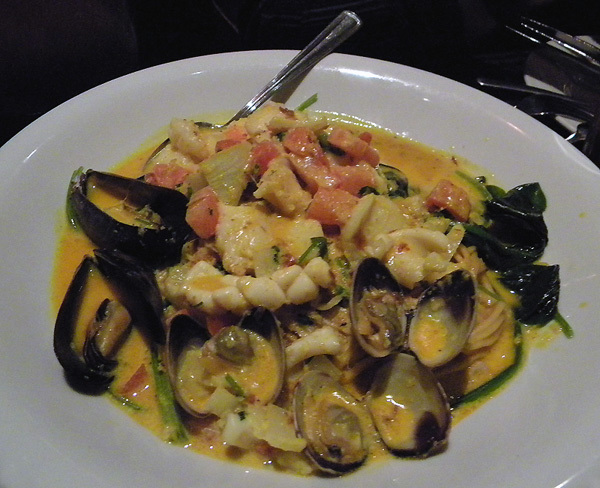 (Incidentally,our local Dungeness Crab has become an international sensation and the price has risen to the point that we can no longer afford it – too bad – crab is one of my favourite dishes. 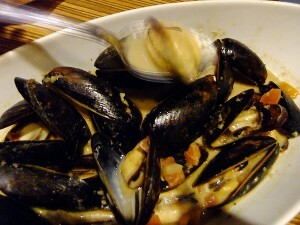 Steamed Mussels in Garlic & Ginger: this dish is listed in the appetizers as ‘steamed mussels in garlic & ginger’, and also listed on the tasting menu as ‘steamed mussels in cumin & ginger’. Whatever its name the dish is sublime! Highly recommended! 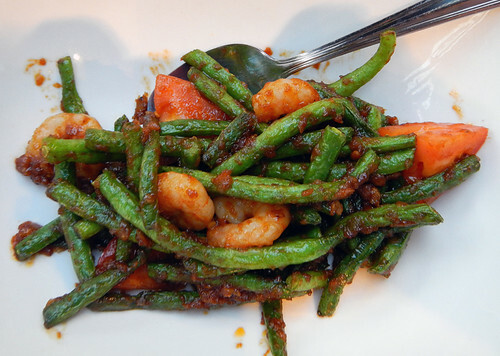 Sambal Green Beans: another favourite on the menu. If we’re with a large group of people I usually try and order two of these just so that I can get my fair share! This is great thing to order if you have guests who are not familiar with Malaysian food. 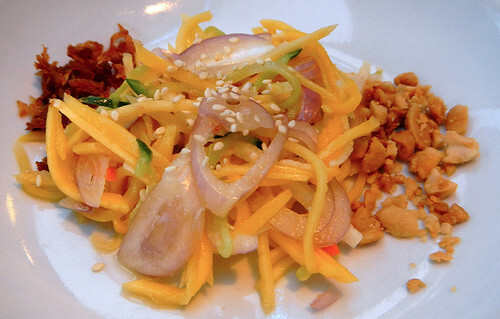 It starts with four appetizers: Mango Salad, Roti Canai, the ever sublime Steamed Mussels in Garlic & Ginger (see above) and Chicken Satay with Peanut Sauce. 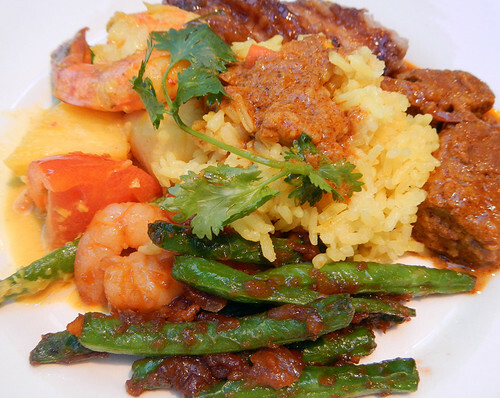 This is followed by four main course dishes: Beef Rendang, Caramelized Ginger Sablefish, Sambal Green Beans (see above) and Gulai Prawns & Scallops, plus a side of Tumeric Rice. 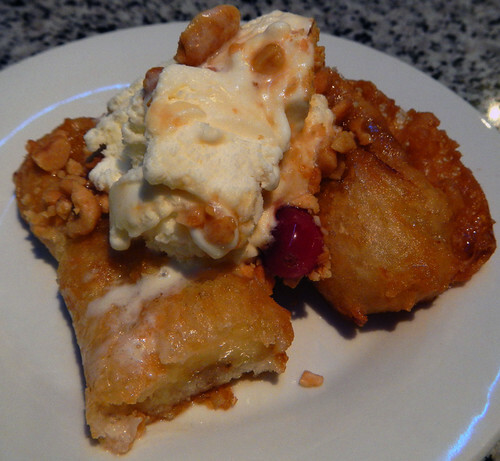 The dessert on the tasting menu is a treat: Fried Banana with Ice Cream, Peanuts and Caramel Sauce.